stealing the ball. Photo: Twitter/@PascalZidane. Obviously, let me start off by saying our thoughts and prayers are with Fabrice Muamba, as he recovers from a horrific cardiac arrest on the pitch in the FA Cup on Saturday. It's wonderful to hear that he is showing signs of recovery, breathing on his own, talking, and recognizing family members. Get well soon. On to the matter at hand, it's been a while since Arsenal's latest last gasp winner. Last Monday, it was Tom Vermaelen with the goal, coming after 94 minutes had already been played. Boy, it's a good thing Tim Krul wasted all that time during the match, otherwise Arsenal would not have had the time for that goal! It's five straight wins in the league, four straight from behind, and three out of four with winners coming in second half injury time. How about a comfortable win, for once? Arsenal have a string of positive results at Goodison Park; three wins and a draw from their last four trips to Everton. A win today would mean more positive momentum for this team going forward. It would be Arsenal's first six match winning streak in the league since two years ago yesterday. Everton are by no means an easy side to face when they're home; they've beaten the likes of Manchester City, Chelsea, and Tottenham at Goodison Park, all over the past two months. With ten matches to play, obviously every game is crucial. With the ball rolling so well as of late, it feels even more crucial to keep that going. 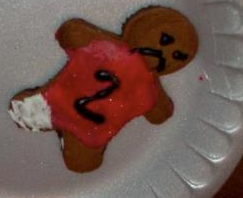 Even Gingerbread Man Diaby has a cast. And a frown. And nobody wanted to eat him. Since it has been nine days since the last time Arsenal have played a game, it's safe to say this side is probably not going to have too many tired legs. As such, it's hard to imagine Arsene Wenger making any changes to the side that beat Newcastle last Monday. Rest is a wonderful thing at this stage in the season; the only fear is that you can't talk much about form when you haven't played in so long. The injury list has not changed much either. Abou Diaby played an hour for the reserves yesterday and scored a goal, but also went down injured in the process. He played another ten minutes after the goal/injury to his ankle and seemed to shake it off just fine. We know that Per Mertesacker's Arsenal season is over. He would, at best, just be returning to training by season's end, but would not be match fit in time. The timeline on Jack Wilshere is still anybody's guess; you would think, by now, the team would still be erring on the side of caution with him. Sebastien Squillaci is back in full training (oh, good.) Francis Coquelin was "two weeks away" as of March 15, so next weekend's QPR game may still come too early for him. Predicted XI: Szczesny, Sagna, Koscielny, Vermaelen, Gibbs, Song, Arteta, Rosicky, Oxlade-Chamberlain, Walcott, van Persie. to watch in this match. Photo: Everton's official site. Everton have only three injury concerns. Darron Gibson, who came to the Toffees from Manchester United in the January transfer window, remains out at least until this weekend with a knee injury. Seamus Coleman left Everton's FA Cup draw with Sunderland with a groin twinge. Jack Rodwell is a doubt with a hamstring injury recurrence. Fixture congestion has led to David Moyes's use of rotation in the squad as of late. Prioritizing the FA Cup and a shot at silverware, Moyes rotated the squad for their Merseyside derby with Liverpool, and the Toffees lost 3-0. With an FA Cup replay coming up next week and a match, of course, at the weekend, you would suspect that if Everton were going to rotate again any time soon, it would be against Swansea on Saturday, and not today. The only change I can see Moyes making from the squad that played Sunderland in the FA Cup this past weekend is the addition of Steven Pienaar, who was cup-tied and unavailable. There was a great piece you might have heard about on Zonal Marking this week, which has been reproduced on the Guardian, and analyzed in a more Arsenal-centric way by Gingers for Limpar, regarding teams' tendencies to attack more on one side of the pitch than the other. The take-away is that Arsenal attack more from the right and Everton attack more from the left. Suffice it to say that means the biggest match-up to watch in this game is how Bacary Sagna and Theo Walcott combine against Leighton Baines and Steven Pienaar. 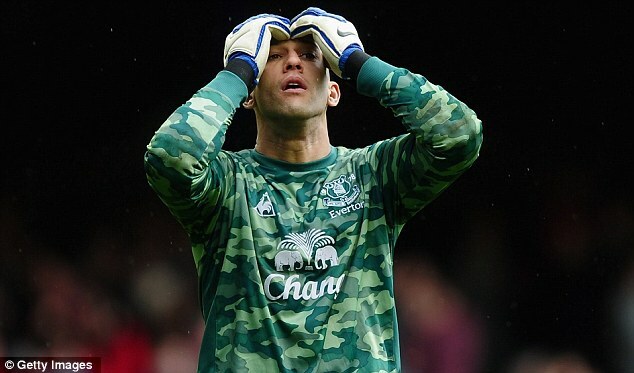 Predicted XI: Howard, Neville, Heitinga, Distin, Baines, Fellaini, Osman, Cahill, Drenthe, Pienaar, Jelavic. U-S-A. Not today. Photo: Daily Mail. Everton are in the middle of a minor hiccup. Since beating Tottenham on March 10, the Toffees have lost their local derby in miserable fashion, 3-0 to Liverpool, then failed to get anything going in a 1-1 FA Cup draw with Sunderland that will take them to a replay. Before the loss to Liverpool, Everton were unbeaten in seven in the league. That list of results gets really confusing when you break it down, though. It includes three wins over Manchester City, Chelsea, and Tottenham Hotspur, and four draws against Aston Villa, Blackburn Rovers, Wigan Athletic, and Queens Park Rangers. The take-away from that statistic is how Everton handles their opponent by type. The Toffees struggle more against sides that sit back and maintain their shape, as you can see from the 1-1 draw with Sunderland, the teams they've drawn recently, and losses earlier this year against the likes of Stoke. They're a lot like Arsenal notoriously has been, in that respect. courtesy a late goal from Andrew Johnson. This is not that Andrew Johnson. Arsenal are unbeaten in nine matches against Everton and have won three straight. In the reverse fixture, Everton tried to play a high line and burn Arsenal on the counter, but ultimately sat back too much, played for a draw, got burned by a perfect Alex Song through ball and a perfect Robin van Persie volley, and Arsenal won 1-0 to celebrate their 125th birthday. Last year, Arsenal won both contests by 2-1 scorelines. At Goodison Park in November of 2010, Arsenal led 2-0 through Sagna and Cesc Fabregas goals, then they sat back on their lead, conceded a late goal to Tim Cahill, and hung on to the win for dear life. 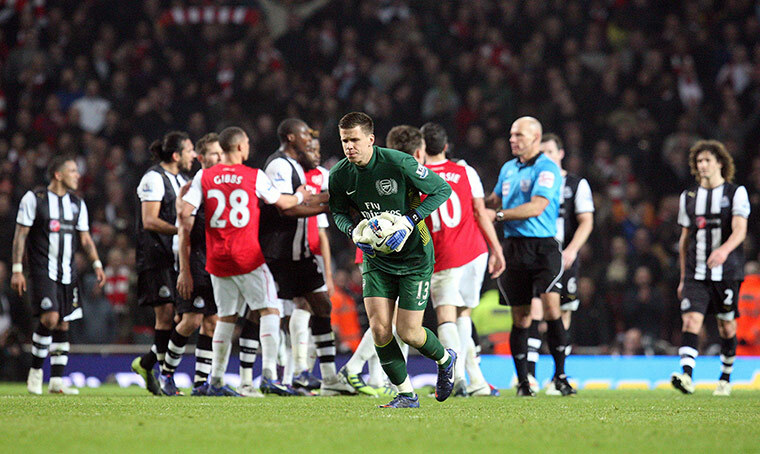 In February of 2011, Arsenal won 2-1 at the Emirates. Andrei Arshavin and Laurent Koscielny goals canceled out Louis Saha's controversial, possibly offside opening goal that was allowed by Lee Mason, who also happens to be the referee today. Arsenal have handed Everton some of their heaviest defeats under David Moyes including a 7-0 victory and a 6-1 win at Goodison Park in the season opening game in August of 2009. Five different Arsenal players scored that day, but of them, only Vermaelen remains with the squad. Fabregas had a brace, with other goals coming from Denilson, William Gallas, and Eduardo. Everton's last win over Arsenal was on March 18, 2007 by a 1-0 scoreline. Andrew Johnson (and not the pictured 17th President of the United States, apparently) had the only goal in injury time. The referee is Lancashire-based Lee Mason. Mason has made a lot of strange calls against Arsenal in the past, including Saha's controversial goal mentioned above. The controversy about that involved the fact that Saha was standing in an offside position when the ball was played, but received it during what was considered a second "phase" of play, solely because Laurent Koscielny attempted (and failed) to block the through ball. Mason's only Arsenal match this season was the win over Stoke at the Emirates in October, though our recap man Sean will tell you (or, I should say, did at the time) that he had a shockingly bad game. Mason has worked three Everton matches this year: a 1-0 win at Blackburn, which was won on an injury time penalty (by Mikel Arteta,) a 2-1 extra time loss to Chelsea in the Carling Cup (which saw a red card to both sides,) and a 1-0 loss to Stoke at home in December. Those two red cards in the Carling Cup match are the only two reds he has shown this season, in 24 matches. Get well soon, Fabrice Muamba. This midweek completes a round of fixtures interrupted by the FA Cup quarterfinals. Fixtures between sides that were both out of the competition were held over the weekend, the rest are being played this midweek. On Saturday, Swansea beat Fulham 3-0 at the Cottage, while Wigan and West Brom played out a 1-1 draw at the DW. On Sunday, Manchester United hit five past ten-man Wolves at Molineux, and Newcastle beat Norwich 1-0. Yesterday, Blackburn beat Sunderland 2-0 at Ewood Park. Bolton's match with Aston Villa has been postponed, due to Fabrice Muamba's illness. This means Villa will not have played for exactly two weeks when they visit the Emirates on Saturday. The big games of the round are today, as Manchester City hosts Chelsea in a huge match at Eastlands, Spurs host Stoke at the Lane, and QPR hosts Liverpool in West London. These are the reverse of the fixtures played the weekend of December 10-11.